Not really. I don't have it; I just like it. 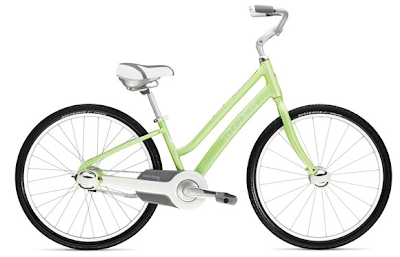 It's Trek's urban Lime bike. Designed to have broad appeal to non-bikers (like moi), it hides all those nasty, intimidating gears and sprockets and cranks and levers and pulleys. Good. I don't want to see that stuff. I also never go bike-riding, but this could be the machine that gets me to start. Love the green color. It's similar to my Supercycle cruiser which I bought this April. I'm also a non-bike person and I got it purely for pleasure. On sale at Canadian Tire for $120! I'm still riding it a lot around the neighbourhood. Here's a pic. They even used it in The Nanny Diaries movie! I like that the seat looks like a seat and not a torture device! The handle bars are normal too! I could wear a pretty skirt and a flowing scarf and ride this down by the beach. Well, that's how I imagine people ride this bike! Good luck. Enjoy the solitude and wind in your hair without polluting! Ha, someone shared this bike with me just tonight. I have been on the hunt for a new bike now that my 8 year old wants to ride everywhere. It looks great. ooooo.... so cute! I wish I had the balance and the buff legs for a bike! By the way, love your blog! ooh looks like a dutch bike. just returned from the netherlands and really want one again. we lived there a long time ago and I had a great dutch bike. you sit straight up and it is so easy on the back and the tush. sigh...makes me want that bike you show too. Oh, and it's a 'ladies bike' too. I stopped cycling after my last bike broke (literally in half) and it was impossible to find a model that you didn't have to fling your leg over. I need something I can hop off of when it wobbles. I love this bike! It would totally motive me, especially if it had a cute little wicker basket on the front. Hmmm... maybe I should paint mine and pretend it's this bike. That will get me peddling! I love my bike, especially going around in the beautiful weather we have been having. Cole, I WAS there, hiding in the bushes!